Pangea Organics may have started off with a few homemade barsoaps, but they have expanded into a full skincare line that includes moisturizers, toners, eye cream, facial masks and more. Pangea’s products are crafted in small batches, using organic and fair trade ingredients (love that!). 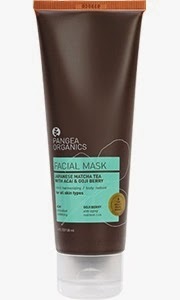 Thanks to Betty, @bettylovesorganic, a Pangea Organics Beauty Ecologist, I was fortunate enough to be able to sample a few products from the Pangea Organics line, which will come in a full review in a week or so, but TODAY, I will be reviewing the award-winning “Japanese Matcha Tea Acai Goji Berry Facial Mask”. The Japanese Matcha Tea Acai Goji Berry Facial Mask, is a gluten-free and vegan treatment. The Matcha Tea, aka green tea, is chock full of antioxidants, which help to fight against free radicals, while brightening and evening your skin-tone. Actually, the mask includes three teas, which are all employed in both whole leaf and extract forms to ensure maximum potency for antioxidant, restorative and energizing effects. Additionally, this mask also has Acai and Goji Berries. The Acai Berry is another antioxidant that has revitalizing, and skin protecting properties. The Goji Berry is also nutrient-rich antioxidant, and has anti-aging and skin rejuvenating benefits. Moreover, the mask contains green and white clays that work together to restore, balance, cleanse and detoxify. The mask also contains four sea vegetables that re-mineralize, hydrate and oxygenate your skin. The jojoba and sunflower seed oils, as well as other essential oils, are found in the mask and further nourish and moisturize the skin. Did I like the Mask? I applied and wore the mask for about 15-20 minutes, and I absolutely loved it. If you have ever blended seaweed (I feed my 9 month old Korean seaweed soup), that is sort of what the mask looks like. It is a green and white clay mask, but it does not have that typical texture. Rather, it feels like you are applying a scrub as opposed to a mask. What I liked most about the mask, and how it differs from most masks I have used, is that the mask contains small little sugarcane beads that exfoliate your dead skin and unclog pores! The sugarcane also supports the skin's natural production of elastin and collagen. Thus, when you rinse off the mask, your skin feels baby soft! The Matcha Tea mask is truly a staple to keep in your beauty arsenal, especially, before a big event when you need to prep your skin to allow for an even, smooth, and flawless make-up application. The Japanese Matcha Tea Acai Goji Berry Facial Mask is $45 for 4 fl. oz. It is available on pangeaorganics.com. Or feel free to contact Betty, bettylovesorganic@gmail.com, and she may be able to send you a sample.